The printer is rapidly taking shape now. Since the last post the motors have all been fitted and all but one of the belts have been attached (the last one needs a replacement part to arrive before it can be fitted as well). 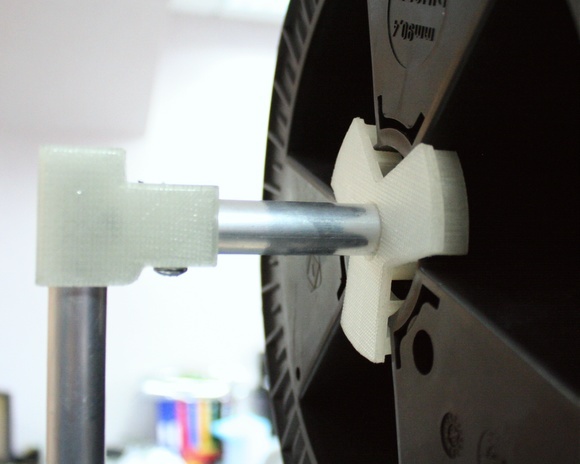 The adjustable bed that the printer prints onto has been fitted onto the Z axis and it all moves up and down – however currently by hand until the control panel is built and attached. There’s still quite a few steps to complete before it’ll be ready – including all of the diagonal ties for the side, the extruder/hot end assembly, wiring and control panel. 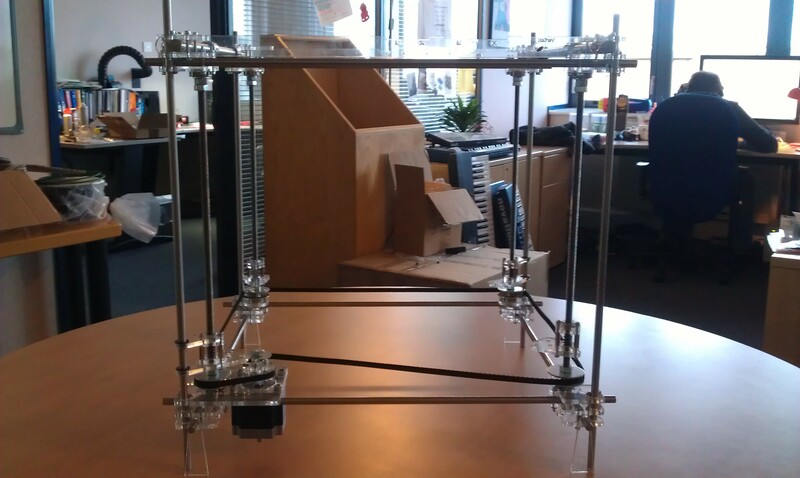 The printer has started to take shape now and the frame of the printer is finally assembled. It took quite a long time to get the frame perfectly square with many adjustments and readjustments. The top and bottom frames are set using jigs to keep the frame square and then a set of vernier calipers were needed to measure the overlap of the bars from the corners. The difficulty with this stage was getting all of the different plates and bolts set correctly. Not only did the spacings between corners need to be correct but each of the acrylic plates that make up the corners need to be level in order for the bearings on the idlers to run smoothly. So for quite a while now the idea of having a 3D printer has bounced around the office. Many people have thought of various different things that they would like to make with it, so we took the plunge and purchased one. The printer that we have bought is a Rapman 3.2 3D printer kit, available from www.bitsfrombytes.com. 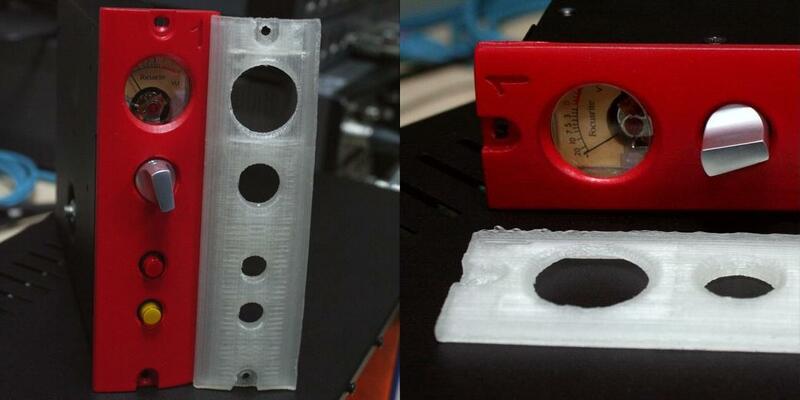 We also purchased the optional extra of having the hot end (the part that melts the plastic filament) pre built. As the name suggested the printer does come in kit form and requires complete assembly before it will be ready to produce its first 3D print. 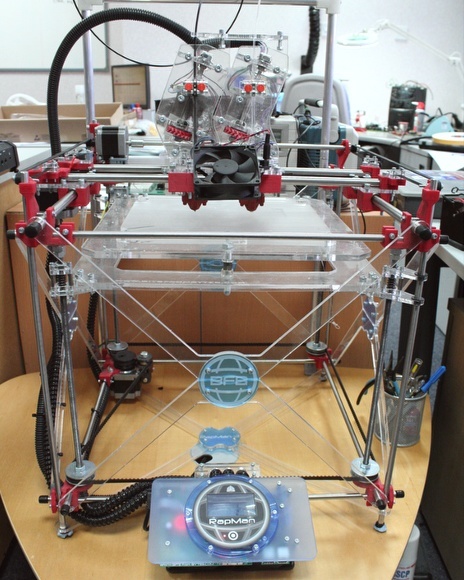 In order to assemble the printer there is a 106 page build manual to work through, which should result in a fully functional 3D printer for everyone in the office to use to make their ideas into 3D objects. So far most of the sub assemblies have been built that are required to start putting together the frame of the printer. However although it look like lots of parts have been made there’s still plenty of work before the printer will be finished. I’ve attached some photos of the work so far and I’ll keep you all updated as the work progresses.